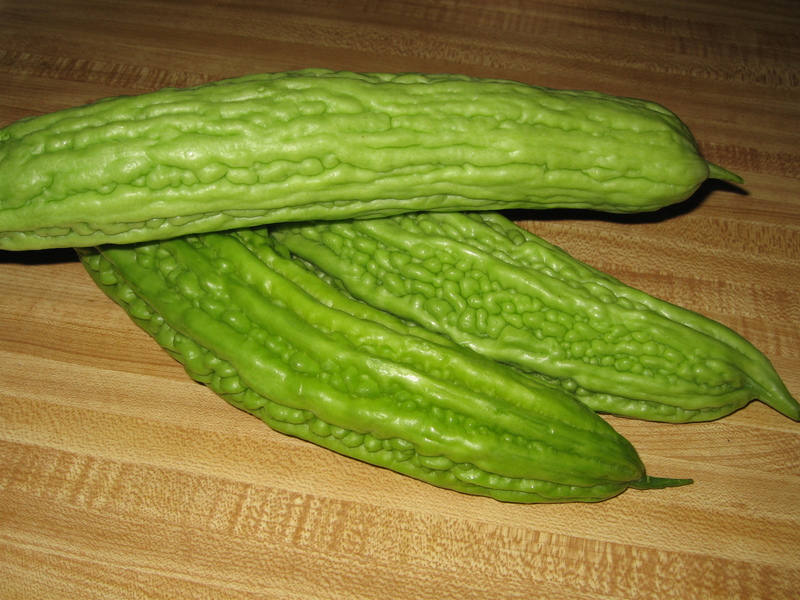 Like brussel sprouts, bitter melon is one of those things that you have when you’re a kid that you absolutely hate, but as you get older and your palette matures, becomes one of those things that you grow to appreciate and like. As a child, I hated, no, positively abhorred bitter melon and felt a small piece of my soul shrivel up every time my mother prepared it (which was quite often as my mother was of firm belief that bitter melon was one of those “super foods”). My tastebuds cried and they cried often. Beautifully green and each melon having a unique design and pattern, you should be able to find this in most asian supermarkets. There are generally 2 varieties that I’ve seen, asian and indian. The asian variety is what I’ve used here while the indian has a much more pronounced and aggressive pattern. 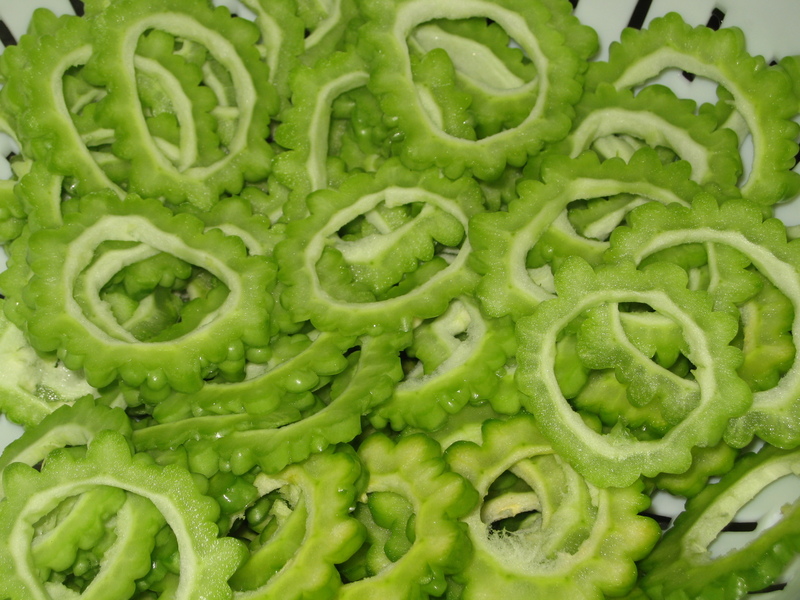 Easy to prepare, it’s just a matter of washing and drying each melon, and then slicing and removing the seeds. I prepared this dish in the way that my father best likes it. Sauteed with some pork belly and a bit of egg and then served with rice and some dipping sauce on the side. 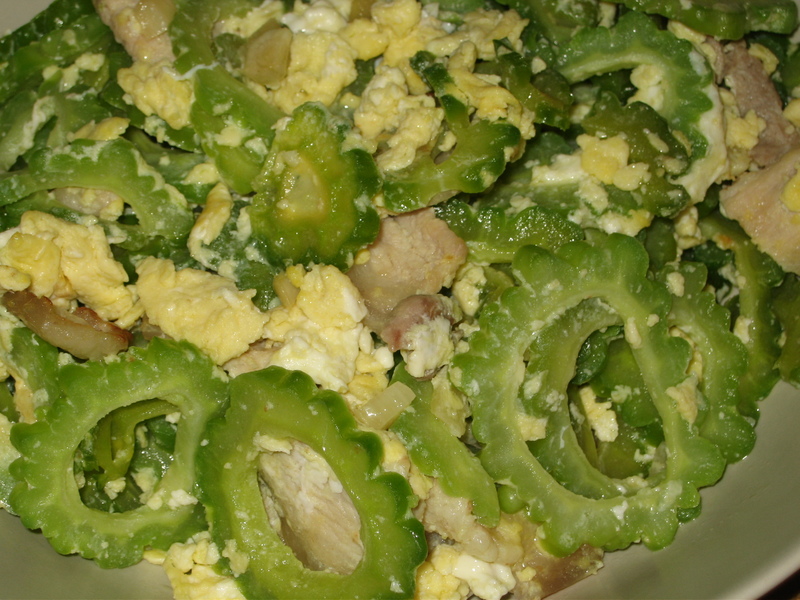 While my mom was the one who traditionally made this dish, it reminds me more of my father as he and I used to sit together and try our best to eat this dish…him eating a bite first and convincing me that it wasn’t so bad. Dads…their work is never done! As you would expect, it is bitter without a doubt, but it’s a bitter that I think finishes nice and clean without any lingering awfulness that we usually associate with horribly bitter foods. Your first taste of this will no doubt send your tastebuds reeling, but I can assure that once you get over the initial bitterness, you’ll begin to appreciate this vegetable’s unique flavor profile. Paired up with eggs here and some pork belly to give it an extra depth of flavor and break down some of that bitter intensity, it’s a nice, easy, and light meal to prepare. Prepare the bitter melon by washing and drying each one. Slice each one in half horizontally and using a small spoon, gently dig out and remove the soft inner white pith and seeds from each half. Slice each half into 1/4″ rings, set aside. Heat olive oil over high heat till it shimmers. Add garlic and saute till fragrant, about 1 minute. 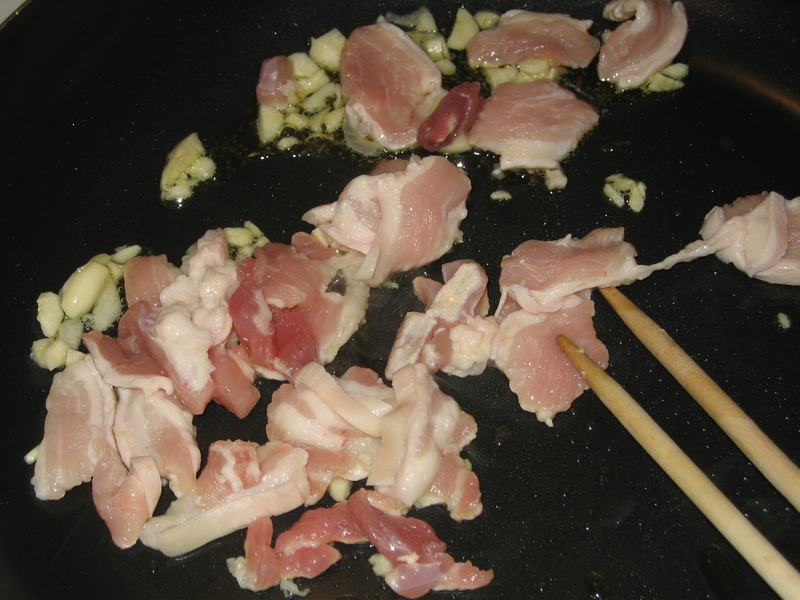 Add in pork belly (or whatever protein you’re using) and saute till brown, about 5-7 minutes. 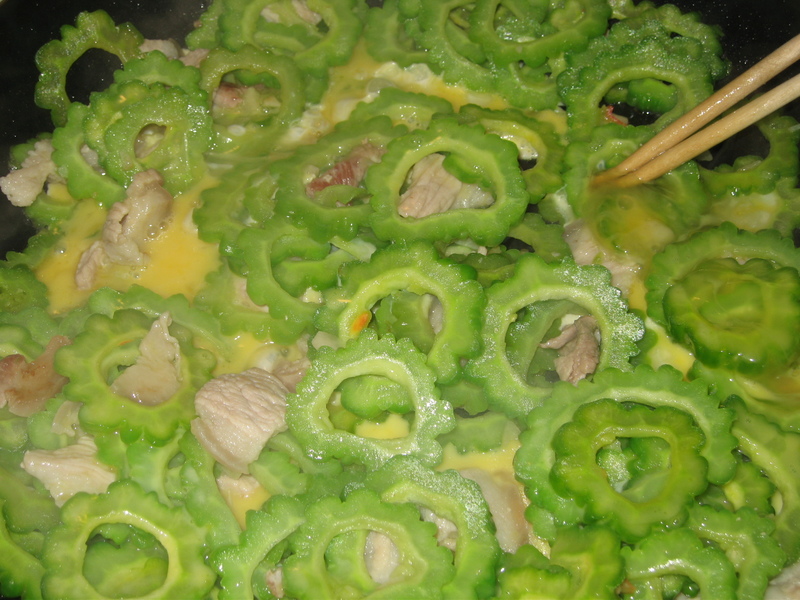 Add in bitter melon rings and continue to saute over high heat until melon becomes a more vibrant shade of green and becomes a little tender, about 3-4 minutes. Season with salt and pepper. Pour beaten egg mixture into pan and allow to sit for about 1 minute. 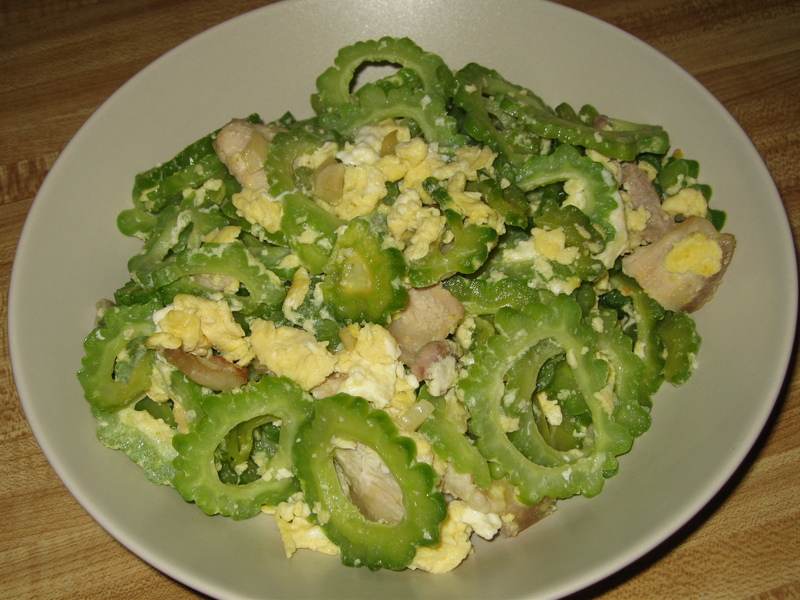 Using a wooden spoon or chopsticks, gently swirl and turn over the bitter melon in the pan, the idea is that you want to cook the eggs and break it up amongst the melon. Keep doing this until eggs are done, about another 2 minutes. Remove from heat and serve. ~ by tastydesu on August 11, 2010. Thank you so much for introducing me to a new vegetable (I think!) I am anxious to give it a try. Lamingtons…the Aussie treat that I never knew even existed! Spicy and Cheesy Brussels Sprouts…The gateway sprout recipe! Williamstown, Wedding, and Baked Pears, oh my!